Put on your pasta pants and bring your salted water to a boil—it's National Macaroni Day! These super comforting, indulgent mac and cheese upgrades are the perfect way to celebrate. 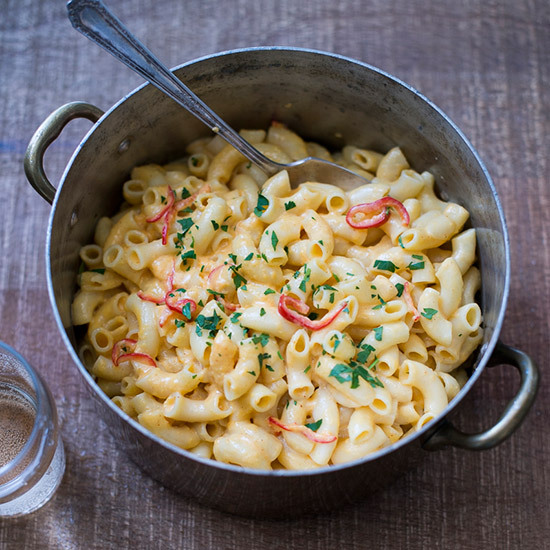 This easy and delicious mac and cheese recipe by starchef Marcus Samuelsson features three kinds of cheese, including cream cheese for that extra creaminess. Sun-dried tomatoes add lots of flavor to the sauce. Fresh jalapeños add a spicy twist to this classic stovetop mac and cheese. This delicious macaroni gratin is a far cry from American macaroni and cheese. Chef Benoît Guichard cooks the pasta in milk, then cools the cooking liquid down with ice cubes, a technique that keeps the macaroni from drying out. The dish can be served as a main-course pasta for four with a salad or as an accompaniment to roasted meats or poultry. Hearty and cumin-scented, this casserole has an irresistible cheesy-crisp topping. This comforting macaroni and cheese recipe incorporates mushrooms, white wine, thyme and hominy for an indulgent, updated dinner staple. Chef Paul Kahan ramps up this Italian take on mac and cheese with fresh mozzarella, mortadella, eggs and a rich pork ragù.